Sandstone glade | nr. Calico Rock, Arkansas. Although western sand dune endemics were the top goals on my cicindelophilic wish list during last fall’s Annual Tiger Beetle Trip, I started the trip by leaving St. Louis in the most unlikeliest of directions—south! No, I wasn’t trying to get to Denver without having to drive the tedious stretch of I-70 through Kansas. Rather, I wanted to take advantage of the chance to witness active adults of the Missouri/Arkansas disjunct population of Cicindelidia obsoleta vulturina (prairie tiger beetle)—perhaps my favorite of all tiger beetle species—on the sandstone glades near Calico Rock in north-central Arkansas. Widely disjunct from the main population’s eastern limit of distribution in central Texas, I’ve seen them at many locations in the White River Hills of southwestern Missouri and adjacent Arkansas over the past ten years, but never in the area around Calico Rock where they are best known from the state. I already had precise localities where I knew I could see them, as I had found 3rd-instar larvae earlier in the year (some of which had already emerged as adults), so I wanted see them and document the range of variability exhibited by adults at this southeasternmost known extent of the disjunct population’s distribution. Cicindelidia obsoleta vulturina | nr. Calico Rock, Arkansas. Although the adults were not quite as numerous as I have found them at certain sites in Missouri, I had no trouble finding them once I got to the area where I had collected the larvae this past June. While showing Steve Spomer our Missouri population last year, he commented that our Missouri adults seemed much less flighty than adults he had seen at Calico Rock. I must say that I agree with him, as I found the adults much more difficult to photograph than those in Missouri. To be honest, I had to stalk nearly ten individuals before the male in the photo above finally allowed me to get close to him. When adults are numerous this is not a problem, but in this case every failed attempt required several more minutes of searching for the next subject. Eventually, however, I got my mojo and started having success with the photographs. Unlike true spring-fall species, mating occurs in fall instead of spring. In the main population, and like other members of the genus Cicindelidia, adults are active during the summer months and exhibit the classic “summer” species life history. The Missouri/Arkansas disjunct population, however, shows a phenologic shift in adult activity to the cooler fall months—perhaps in response to the generally droughty conditions that prevail during the summer in this part of the country followed by rains during late summer and into fall. (This is one reason why I think this population may be deserving of separate subspecific status.) In this regard they appear to be “spring-fall” species, but their life history does not match true members of that group, which emerge during fall as sexually immature adults, hibernate during winter, and re-emerge during spring for mating and oviposition. 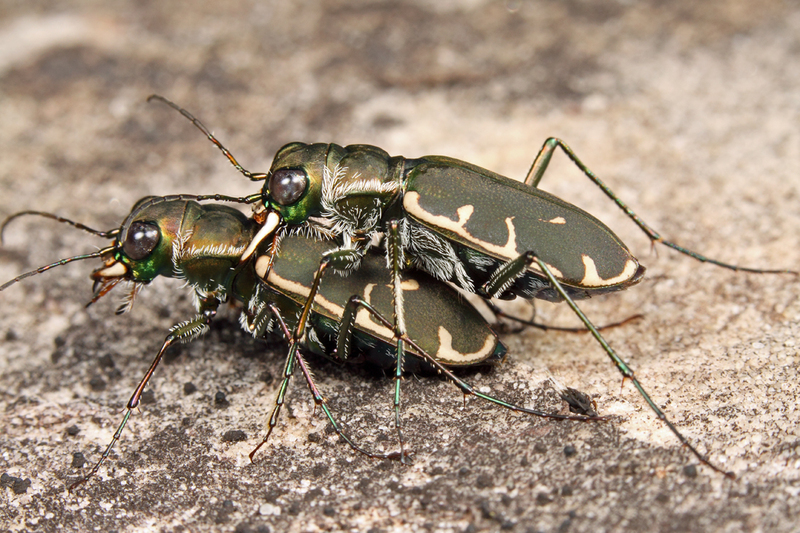 Thus, one never sees adults of classic spring-fall species like Cicindela limbalis mating during the fall. In contrast, adults of this disjunct population emerge, mate, and lay eggs all during the fall before the onset of winter, then they’re done. The eggs hatch during fall and require another season or two to reach 3rd-instar and pupate during the summer for fall emergence. Coloration likely functions in crypsis, as shown by this individual nestled in amongst moss and lichens. When viewed as prepared specimens in a cabinet, C. obsoleta and its subspecies are among the most conspicuous of species due to their large size (in Missouri and Arkansas only Tetracha virginica is larger), olive green coloration, and bold white maculations. More than likely, however, the combination of color and markings serve a crypsis function in their native habitat. This is clearly evident with the individual in the above photograph, who had retreated to a moss- and lichen-covered rock crevice in his efforts to evade my lens. Squint your eyes a little bit, and he almost disappears! It must be similar for visually based predators such as birds and lizards. On more open ground and from a lower angle, the beetle is much more visible. This same individual, however, becomes quite visible when chased onto more open rock surfaces (and viewed more laterally than from above). It is common to see individuals out in the open such as this, but more often than not when alarmed they fly or run to less exposed areas, relying on their cryptic coloration to avoid detection. In fact, when I follow beetles that have evaded me to the spot where I am sure they must have landed, I often fail to see them even though I am looking almost exactly in the area where they are sitting until they start to crawl and their movement catches my attention. A rather greenish individual tries to hide amongst lichens and shortleaf pine duff. I have observed a great deal of variability in coloration and maculation at locations in Missouri, with individuals ranging from bright green to dull olive-green to dark green and even brown, and the markings ranging from complete to interrupted. I saw a similar amount of variability in the Calico Rock population, with the exception of brownish (which I have only seen at the northernmost localities in Missouri) and fully maculated individuals. Most of the Calico Rock individuals were dull olive-green, but the female in the above photo (trying to evade my attentions by hiding amongst lichens and pine duff) was as bright a green as I’ve seen in any individual. A very weakly maculate individual. As mentioned above, I didn’t seen any individuals that I would consider fully maculated, and several that I saw were more weakly maculated than any I’ve seen in Missouri. The female in the photograph above was the most weakly-marked individual that I saw, with the lateral and median bands greatly interruped—the latter nearly reduced to small discal spots. A dark, almost blackish female. While I did not see brownish individuals as I have seen at the northernmost localities in Missouri, I did see the occasional blackish individual—the one in the above photograph also exhibiting about the greatest degree of macular development that I observed among the adults seen. My impression now is that there are clinal patterns to the coloration and macular development in this disjunct population, with markings tending to be more developed in northern localities. With the specimens collected from this and the many other locations throughout the disjunct population’s range that I have now sampled, a more critical assessment of variability in this population may now be possible. Beetle's-eye view of sandstone glade habitat. 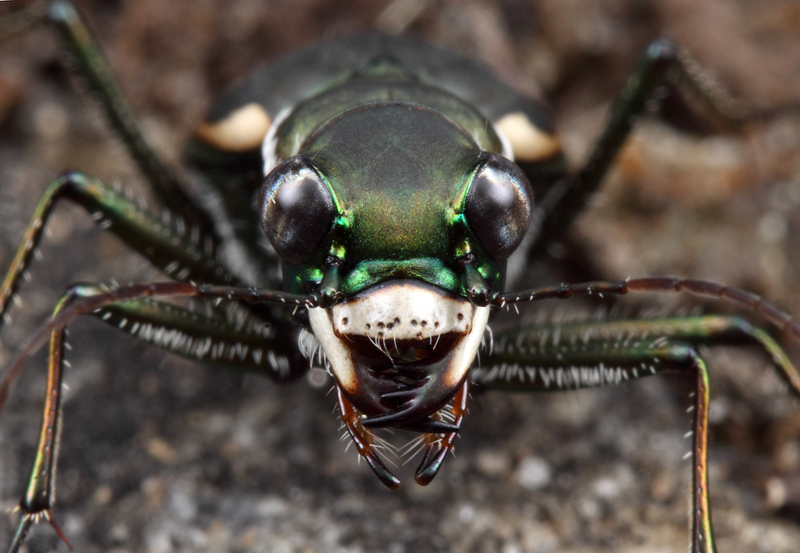 It has become standard practice for me to photograph tiger beetle habitats whenever I can. 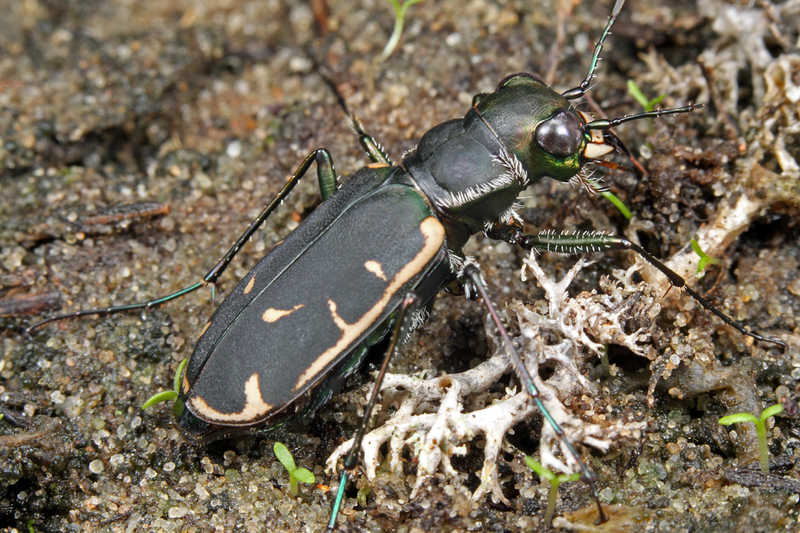 However, I’ve become interested recently in trying to understand how tiger beetles perceive their own habitats. While this isn’t possible to know precisely, ground level photographs can provide at least a clue into seeing the world from a beetle’s eye. I almost find this perspective of the glade habitat more interesting than the human perspective shown in the first photograph. The last sight that their prey sees. There can be little doubt about what the beetles themselves look like from the perspective of their prey. The photograph above may not properly represent the image generated by an insect’s collective ommatidia, but it certainly must be just as frightening! 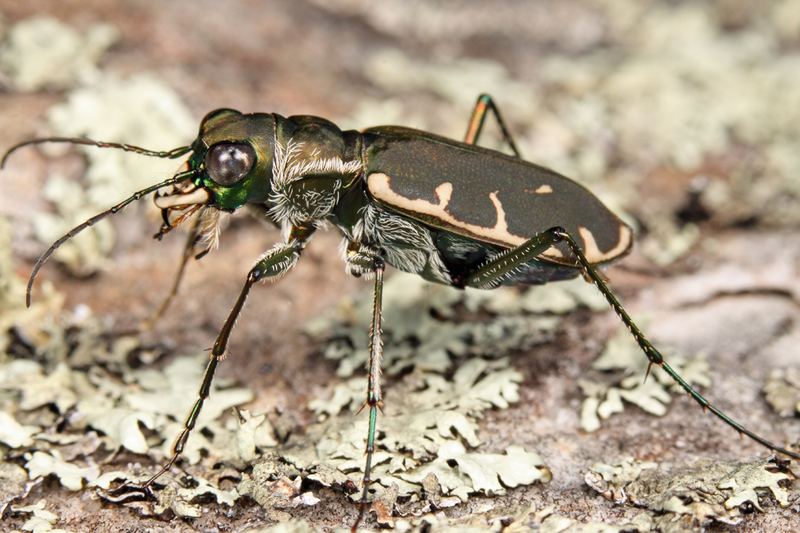 This entry was posted in Cicindelidae, Coleoptera and tagged Arkansas, beetles, collecting trip, entomology, glades, insects, landscapes, nature, science, tiger beetles. Bookmark the permalink. 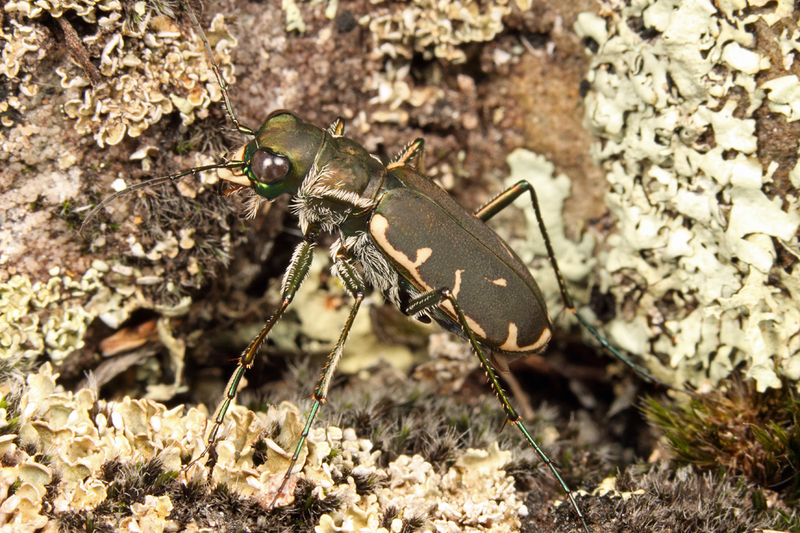 Loved your post about the tiger beetles at Calico Rock. I think I will use them in my eventual natural history book on Arkansas if you do nto mind? What a wonderful little beetle! Thanks for your information concerning this rare critter. Would like to see that book! I like the ‘tiger beetles eye-view of the habitat, good idea! Question: can you please give me the distinction between ‘maculation’ and ‘coloration’ in layman’s terms? Coloration is the background coloration, in this case green, olive-green, blackish-green, etc. Maculation refers to the white markings. Another layman’s question: I was interested by your comment about having to stalk nearly ten individuals before getting the photo of the first beetle pictured. I gather that you are not simply collecting all the beetles you see, but are willing to incur a certain amount of inefficiency (in terms of your time) in order to document the beetles photographically without killing them. (I assume that the time spent trying to get a decent shot of fast-moving beetles would be significantly reduced if you simply captured the beetles and killed them.) I wonder about this, since I’ve noticed language at bugguide.net advising users that some people may object to their uploading images of killed specimens. I’m curious to what extent it might be true that the advent of inexpensive digital photography, increased awareness about extinction threats, or other factors might be contributing to a shift away from collecting and toward less-intrusive forms of study. I also wonder what similarities there might be between this shift (if it’s actually taking place) and the well-known transition among bird studiers from making most identifications along the barrel of a shotgun (as was typical in Audubon’s day) to today’s preference for binoculars and cameras. Is there actually such a shift under way among professional or amateur entomologists? If so, can you share any insights you might have into its extent and causes? Thanks. I suspect that the advent of cheap digital photography has primarily served to make a lot more people knowledgeable about insects rather than contributing to a shift away from collecting. In other words, more people are studying insects because they can take pictures of them, but this has little or no impact on the number of people who are actually collecting them. Collector/photographer types like me I think probably represent only a small minority of collectors. I see photography as an added tool to study insects rather than as a replacement for collecting, depending on study goals. 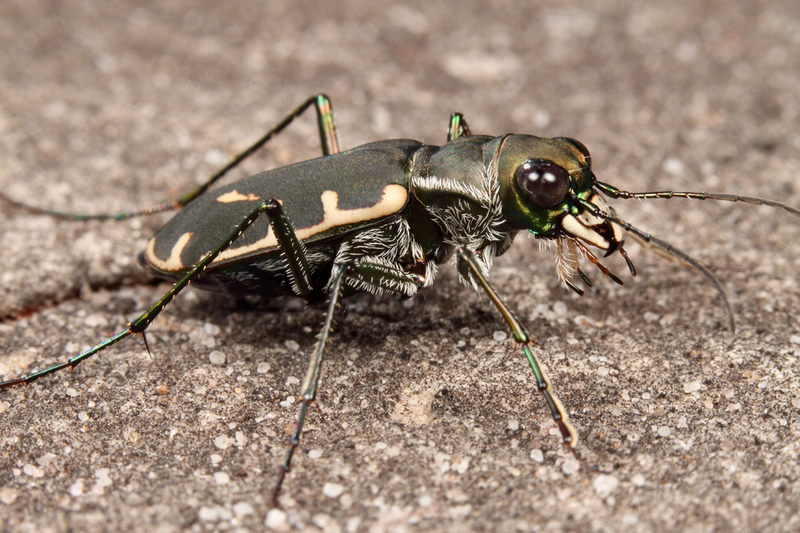 For me these differ for different groups – tiger beetle taxonomy is fairly stable in North America, and I am more interested in the group from a conservation/variation/behavioral standpoint. Photography is good for documenting field behaviors and is more useful as a medium for outreach about their conservation than are pinned specimens. Variability, however, is still best understood through preserved specimens, so I try to collect enough specimens to adequately document the range of observed variation (taking conservation status into consideration, of course). On the other hand, I have more basic alpha-taxonomic interests in other groups such as Buprestidae. I’ll take photographs when I can, but it is not a priority because adults tend to be smaller and less conspicuous and the groups more diverse and less well-known than tiger beetles. (Indeed, many times I don’t even know what species I’m dealing with until I curate them and examine their genitalia.) The time required to photograph them in the field doesn’t have the same payoff as it does for tiger beetles and would only serve to reduce the efficacy of my sampling efforts. If I had to rely only upon photographs of live individuals, most of my research on Buprestidae would grind to a halt! Brings back memories of the southern Front Range – and the large green and nearly black C. obsoleta near Walsenburg. Big bugs. I’d like to see some non-disjuncts of this species someday. Probably also not near-sighted enough. You’ve got a convert on the “beelte’s eye view” pics of the habitat. I really like that perspective. Interesting post, and as usual, excellent photos. I always like to see photos of the habitat as well. I have a specimen of C. obsoleta vulterina from Calico Rock area, although I myself have not been there. It is interesting to compare it with the ones I have from Texas. The Calico specimen has very fine elyra maculations, compared to those from Texas (Montague Co., ). As you are undoubtedly aware, the color variation in the species is also shown further west in C. obsoleta santaclarae in New Mexico and Arizona- everything from black with no maculations to black with, and dark green with, bright green with or only with dots, and brownish red with green legs. This last variability is seen in a specimen from last summer found in Lower Madera Canyon, AZ. Hi Charlie – I haven’t actually seen any populations of this species outside of the MO/AR disjuncts, although I’ve gotten ahold of a specimen or two from the Texas, New Mexico and Arizona populations. The patterns of variability across populations is interesting enough in itself, but the most interesting question in my mind is how well this reflects genetic structure across the whole range of the species, and whether the disjucts have shown sufficient divergence to warrant separate taxonomic status. Mawdsley’s paper provides some insight, but ultimately I think molecular studies will provide the clearest answers. I found it interesting that you had collected insects in this spot. I’m a crop consultant from NE with ISU entomology degree 1971. My brother and I spent several hours in what appears to be this spot in late April about six years ago. I have basically collected few insects in the last 25 years, however have started taking photos. On our visit we were more interested in the plants and scenery though I do recall seeing weather beaten Pipevine Swallowtails. If it is the spot, and I think it is, there is a huge cliff overlooking a bend in the river. When we were there, a gorgeous light pink azalea was in bloom living in a crack in the cliff face. I spent a number of years in the horticulture business and this azalea was notable in being very fragrant smelling much like a carnation or a wild onion or maybe a carlesi viburnum in bloom, not disagreeable like every other one I have smelled. 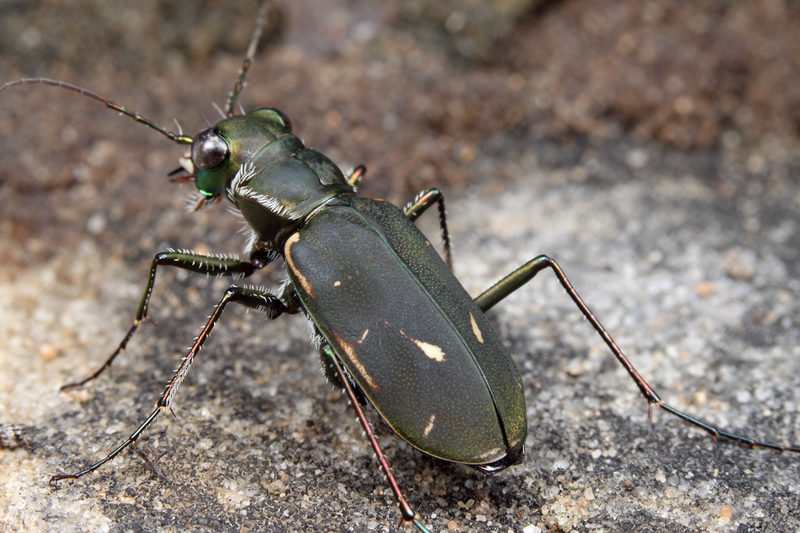 I did not see any tiger beetle activity though it was hot enough to make a person sweat. I’m pretty sure I would have noticed them if there would have been any number active. The place we visited was south across the river, taking the first right and following the road about two miles I think. The road takes a sudden 90 degree turn and as you look straight ahead before the turn there is a large flat area that matches you photos exactly. If a person goes to the edge of the cliff there is woodland to both sides that are well worth exploring for wildflowers and peculiar plant communities. I would highly recommend the spot to anyone doing some collecting. Hi John – yes, that is the spot exactly. Great description of it. In late April that would have been wild azalea, Rhododendron prinophyllum, in full bloom. They are stunning flowers and quite fragrant (the aroma remind me of cloves). If you’re interested you can read about my first experience finding these plants in bloom at my post, Ozark Trail – Marble Creek Section. 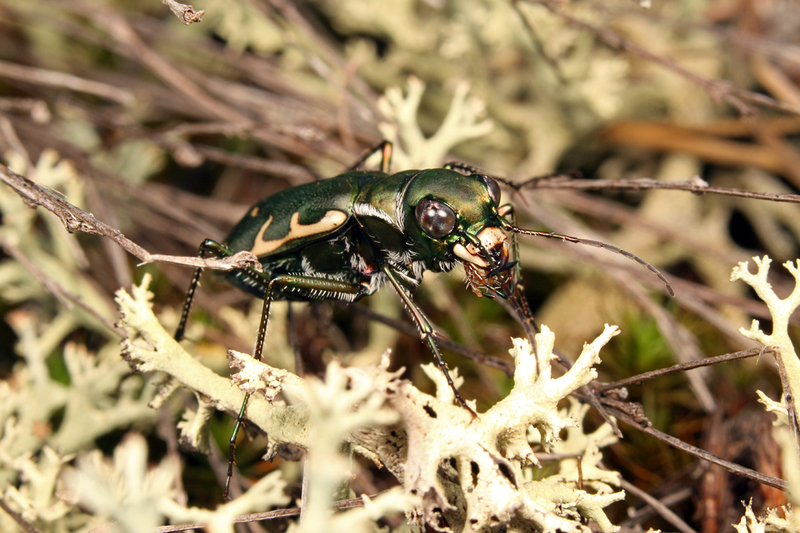 Regarding tiger beetles, there is a smaller red/green species that should be out at that time on the glades, but they can be very elusive and easily overlooked. 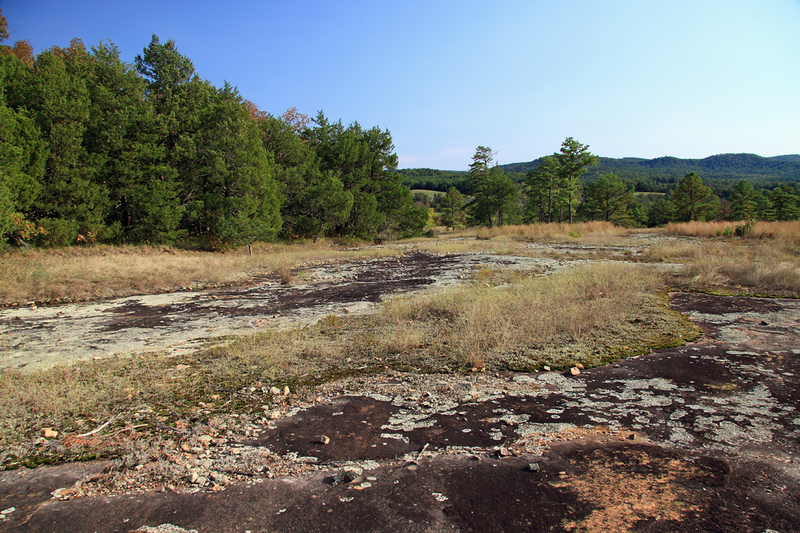 The larger green species that is restricted exclusively to glade habitats in that area and adjacent Missouri (Cicindelidia obsoleta vulturina) is only out during fall (late August to early October). 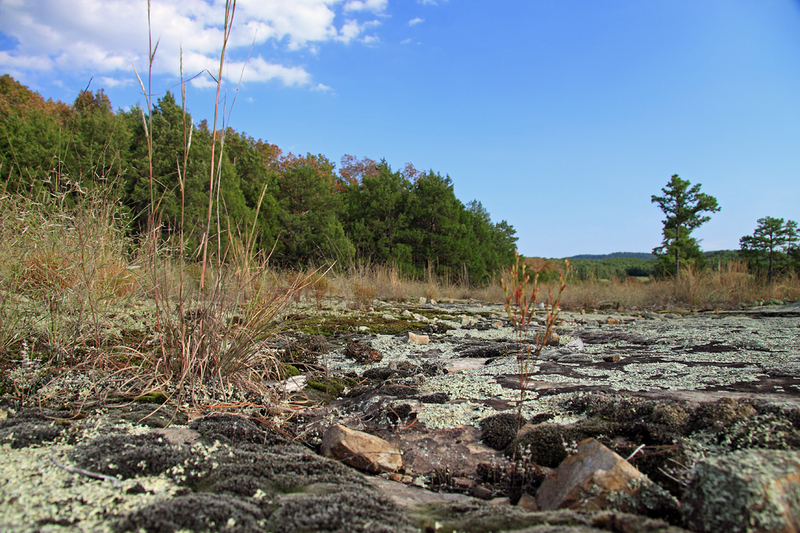 I have a photo of the overlook at Ozark Landscapes — White River in northern Arkansas.